The jury has voted, and it’s time to reveal the winners of the 91mobiles Smartphone Awards 2018. Representing the true voice of the industry, these winners were chosen by a 40-member jury panel comprising the who’s who of Indian tech media. Thanks to the hundreds of years of collective experience spread across the jury panel, you can be sure that the chosen smartphones are really the best of the best in their respective categories. It’s time now to take a look at the nominees in each category, and announce the winners. Do note that for the purpose of these awards, the smartphones that launched in India till the end of November were considered. Before we move on to the nominees and the winners, here’s a look at our esteemed jury panel. 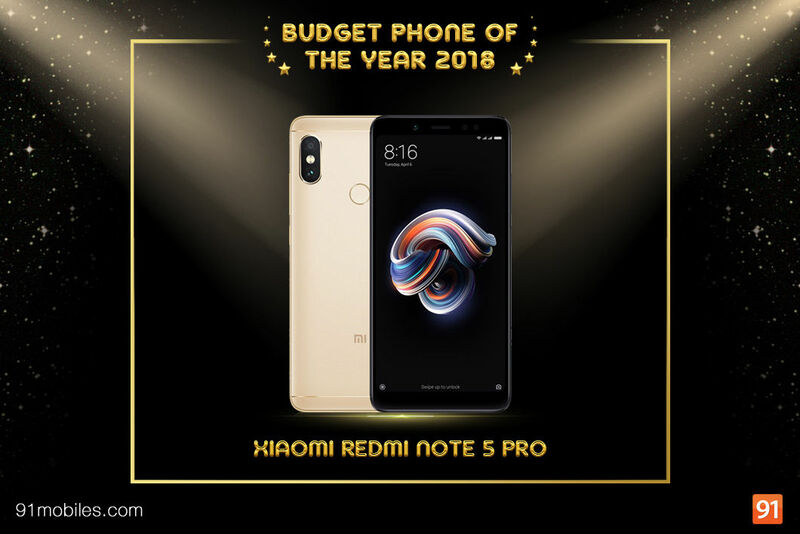 And the Budget Phone of the Year 2018 Award goes to… the Xiaomi Redmi Note 5 Pro! With most number of votes, the smartphone beat the next highest contender quite comfortably. When we reviewed the Redmi Note 5 Pro, we called it the complete package for good reason. A compelling all-rounder that offers smooth performance, a very capable set of cameras (including a 20MP selfie camera) and long battery life, the Redmi Note 5 Pro is very noteworthy as a no-compromise, budget smartphone. The runners-up in this category was the ASUS ZenFone Max Pro M1. Appearing as a solid all-rounder, the ASUS ZenFone Max Pro M1 became the talk of the town as soon as it was announced, mainly for the sheer value for money it offered. From a loaded specs sheet to a powerful battery and a capable set of snappers, it surprised everyone with its aggressive pricing. 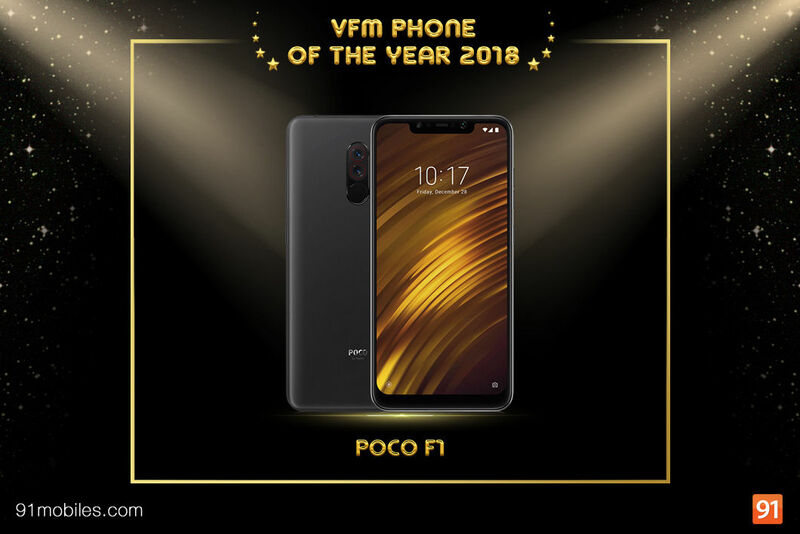 And the VFM Phone of the Year 2018 Award goes to the POCO F1. Surprisingly, the new device has managed to unseat OnePlus from its throne, and come out as a clear winner in this segment with the highest number of votes from the jury. Making its debut under Xiaomi’s new sub-brand, the POCO F1 offers flagship specs at bargain prices. With a bunch of different variants that span the entire Rs 20K to Rs 30K price segment, the POCI F1 is an attempt by Xiaomi to gain market share in the mid-range flagship space, and as far as we can make out, the brand has managed to do that to some extent. The OnePlus 6T follows in second place. Scoring high on all aspects, including a lovely glass-encased design, the inclusion of a water drop notch, and innovating on parameters such as the in-screen fingerprint scanner, the OnePlus 6T makes for a very compelling package indeed. Great photography prowess is no longer the domain of premium smartphones, as we’ve seen quite a few capable shooters in the affordable segment as well. Boasting dual cameras and AI features, smartphones in the sub-Rs 20K segment can offer some surprising results as far as imaging is concerned. Here’s the list of nominees for the Best Camera Phone under Rs 20K. 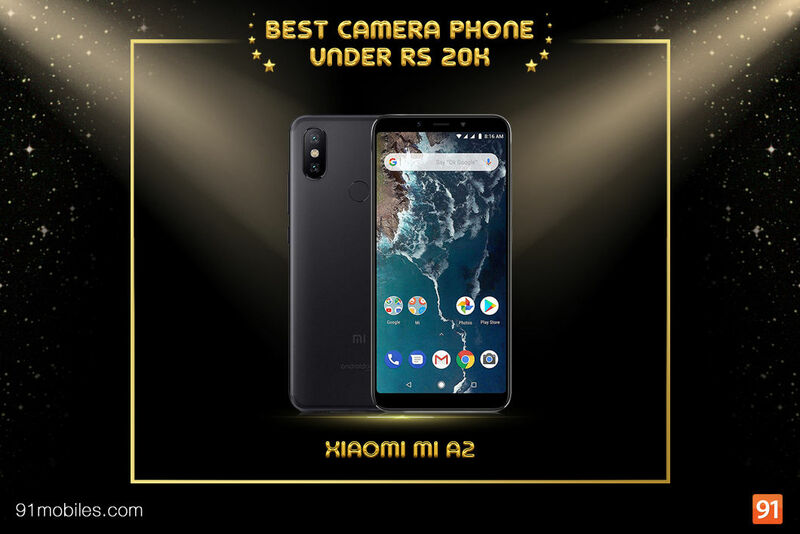 And as can be expected, the Xiaomi Mi A2 was chosen as the winner for the title of the Best Camera Phone under Rs 20K. Its photography prowess is unmatched in this segment, so this came as pretty much a foregone conclusion. Xiaomi’s second Android One offering, the Mi A2, also boasts the very capable Snapdragon 660 SoC, and offers incredible value for money for its asking price. Where it absolutely shines however, is the shooting department. The Mi A2’s camera specs are not just strong on paper, as its 12MP + 20MP dual rear cameras and the 20MP selfie snapper can capture true-to-life images, even in low light, and can handle bokeh shots quite well too. The Honor Play came in a distant second. Apart from the fact that the Honor Play scores high on performance and gaming features, it also offers very capable shooters in the form of a 16MP + 2MP dual rear camera setup, along with a 16MP camera at front handling selfie duties. There are a ton of AR and AI-based features on offer as well. Selfie cameras are probably more crucial these days than rear cameras, which is why many smartphone brands are trying to push the envelope of the front cameras on their offerings. From AI-based features to portrait mode, and from high-resolution sensors to multiple cameras at the front… you can find them all. Here are the nominees for the Selfie Phone of the Year 2018 award. 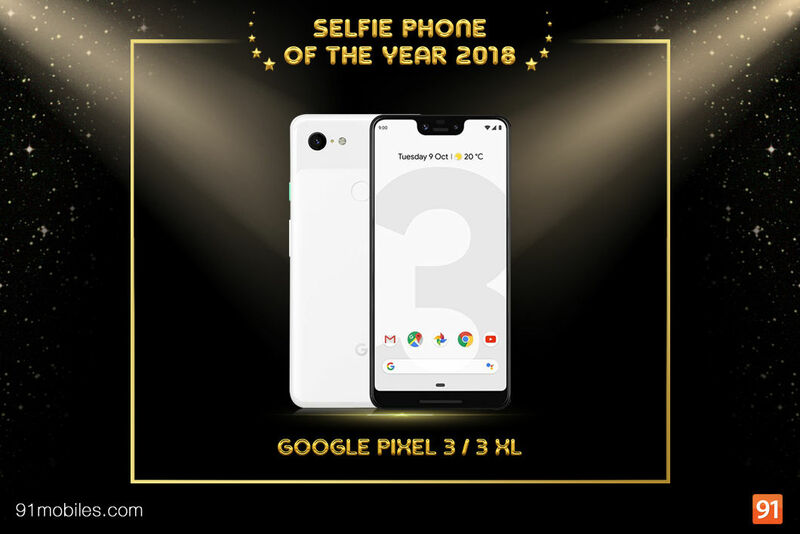 The Google Pixel 3 and 3 XL emerged as the clear winner for the title of the Selfie Phone of the Year, which isn’t surprising give how the Mountain View major has upped the stakes for smartphone cameras this time. This time, Google has added a secondary 8MP sensor at the front for wide-angle shots, and combined with the main 8MP snapper at front, the setup produces great results as far as selfies are concerned. The Vivo V11 Pro and the Apple iPhone XS / XS MAx are tied at second place. Tons of AI features and the high-resolution 25-megapixel front sensor on the Vivo V11 Pro make it a selfie beast, and more important, the phone is able to deliver on the promise as well. And as we mentioned in our review, it can take stunning selfies, and can make anyone look good. Apple’s iPhones always score high in the photography department, and while the iPhone XS and XS Max haven’t really upped the ante in terms of the megapixel count, the devices still stand out as among the best for selfie photography, offering features like portrait mode and portrait lighting effects. Thanks to the infusion of artificial intelligence, computational photography, bigger sensors and pixel sizes, utilisation of multiple sensors and tons of other tech wizardry, cameras on our smartphones have evolved by leaps and bounds in recent times. And as we all know, the best camera is the one you have with you… so let’s take a look at the nominees for the Camera Phone of the Year 2018 award. No two ways about this – the Google Pixel 3 and the Pixel 3 XL have won the crown of the Camera Phone of the Year 2018. It’s amazing what Google has been able to accomplish with just a single rear camera on its latest flagships, defying convention and trends. Despite sporting a single rear camera, especially at a time when rivals have moved on to two, even three or four snappers, the Google Pixel 3 duo is a solid proof of what can be accomplished when good hardware is combined with awesome software. The Pixel 3 and 3 XL bring features like computational photography, Night Sight, Super Res Zoom and quite a few AI and AR-based goodies, and the results speak for themselves. While the Huawei Mate 20 Pro was relegated to second place, it’s clear that this flagship is a very capable shooter as well. With no less than three rear cameras that boast Leica certification, the Mate 20 Pro can easily replace a DSLR, offering features like optical zoom, wide-angle shots, and lots, lots more. Again, the proof of the pudding is in the eating, and the shots captured by the Mate 20 Pro look gorgeous, regardless of the conditions they were shot in. 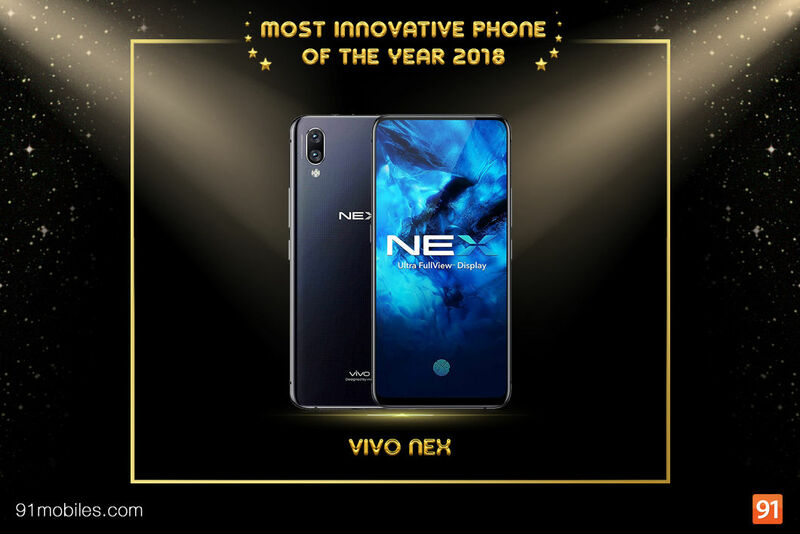 This was a close call, but ultimately the Vivo NEX edged ahead of the next highest contender, the Huawei Mate 20 Pro, to win the title of the Most Innovative Phone of 2018. Instead of taking the notch approach to reducing bezels on the side, the Vivo NEX uses an innovative pop-up selfie camera that not only looks super cool, but is quite capable too. Flagship specs, nice design, powerful battery and capable shooters add on to the already attractive package… all of which is offered at a reasonable price. And as far as the Mate 20 Pro from Huawei is concerned, it’s the world’s first phone with the 7nm Kirin 980 SoC, the world’s first to offer reverse wireless charging, loaded with three Leica-certified cameras, packing a beefy 4,200mAh battery in a sleek glass body, 40W fast charging, and more. This particular category was a toss-up between OnePlus and Xiaomi, as both brands have been able to build strong recall and a loyal user base. At the end, it was OnePlus that won the crown of the Best Brand of the Year, with Xiaomi coming in a close second. It’s commendable how OnePlus has been able to build up a loyal user base within a very short time, and we think it’s not just because of its flagship-grade VFM smartphones. Apart from sticking to its brand ethos, OnePlus has also done quite a few other things right, such as focussing on offline retail, improving service standards and keeping the hype alive. Xiaomi has grown from a brand that no one in the country had heard of just a little over four years ago, to one that is now topping the charts as far as marketshare is concerned. The undisputed champ in the affordable segment, the brand’s strategy with the new sub brand POCO also deserves special mention. However, it’s Realme that deserves applause, as within the very first year of its inception, it has been able to come very close to winning the title, and thanks to very noteworthy offerings like the Realme 1, the Realme 2 Pro and the Real U1, has set our expectations sky high for next year. Ladies and gentlemen, we have a winner! This turned out to be a really close fight, with both the Huawei Mate 20 Pro and the OnePlus 6T vying for the top spot. 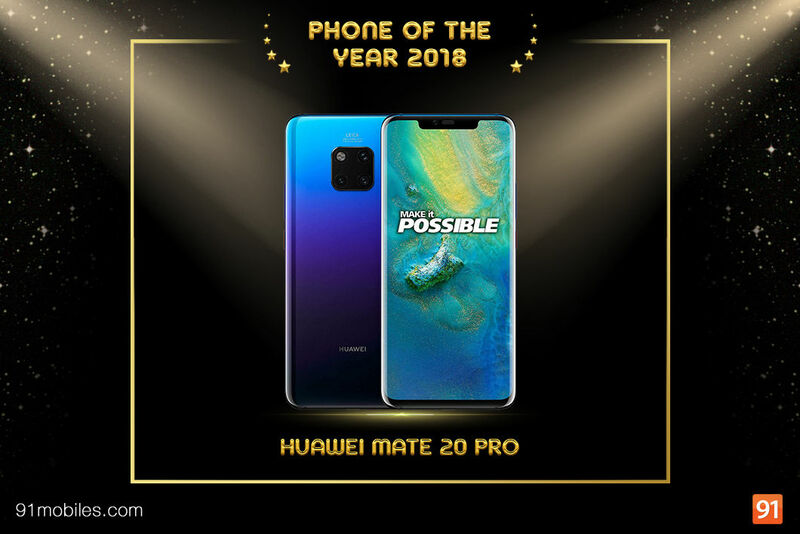 At the end however, it was the Huawei Mate 20 Pro that inched ahead to claim the coveted title of Phone of the Year 2018. Scoring high on innovation and thanks to world-first features like reverse wireless charging, the Mate 20 Pro is truly a loaded phone. Three Leica-certified snappers at the back, a large battery, gorgeous looks, the 7nm Kirin 980 chipset, and a smorgasbord of other compelling features helped take this phone to the very top. And while the OnePlus 6T got second place, the gap between the two devices was really tiny, which just goes on to show how strong the brand’s offering is. While the incredible value offered by the OnePlus 6T can’t be ignored, the new flagship has enough to offer in terms of crucial parameters like performance, camera prowess, features and battery to help make it stand out on its own. Good design, flagship specs that translate into a very smooth user experience, the no-nonsense yet powerful Oxygen OS, solid shooters, the convenience offered by Dash Charge, along with features like a smaller notch, snappy face unlock and in-display fingerprint scanner… all offered at an affordable price, helped the 6T reach this spot. 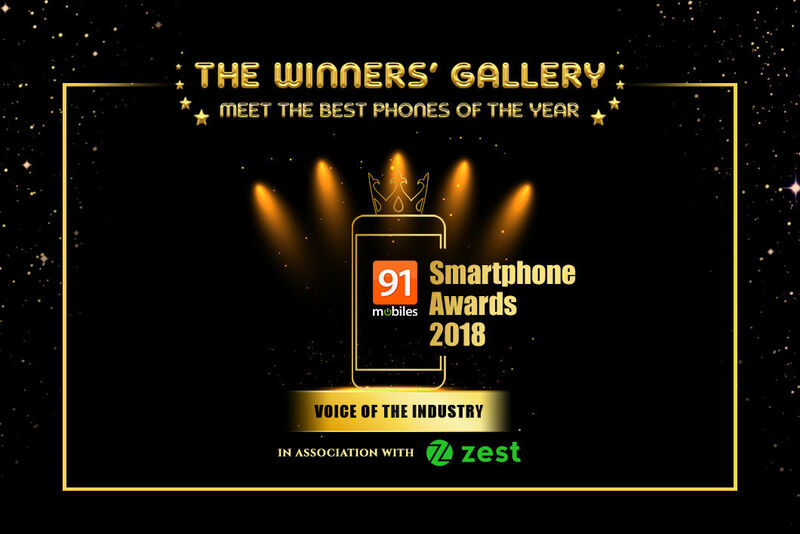 That wraps up the 91mobiles Smartphone Awards 2018 – Voice of the Industry. Congratulations to all the winners, but it’s worth mentioning that all nominees that made it to the final list are winners in their own right. A huge thanks to all 40 members of our esteemed jury panel as well, for bringing their voice and opinion to the fore in helping us choose the winners.